At the Australian Laser and Skin Clinic we know that in the past, people have always spent considerable sums of money and devoted a lot of time to the removal of facial and body hair. Popular methods used have always been time wasting waxing, painful shaving and plucking and slathering on smelly creams and foams. These methods, while effective in the short term, can never produce long lasting hair free results which is why Laser Hair Removal has become the No.1 method in permanent hair removal! Laser hair removal, often achieved with the use of our very effective and advanced Grade 4 Medical Grade Laser machines is suitable for many parts of the face and body with the most popular areas being bikini line, underarms, back, legs and upper lip. Laser Hair Removal is much less painful than waxing or plucking and forget about painful nicks and cuts and that can occur when shaving! Laser Hair Removal can also eliminate unsightly and painful ingrown hairs. Our Class 4 Medical Grade Lasers remove long term ingrown hairs that may have appeared from previous waxing or shaving and prevent future ingrown hairs from appearing. Laser Hair Removal has minimal side effects with the most common being a slight swelling or redness in the area that was treated. These Laser Hair Removal side effects will usually subside quickly and can be soothed with a gentle Laser Aid cream. The permanency of Laser Hair Removal is arguably its greatest drawcard and even after only one Laser Hair Removal treatment an obvious reduction in the amount of hair growing back is often seen. Because Laser Hair Removal is such an advanced technology, people automatically assume that it must be expensive. However due to the popularity of Laser Hair Removal it has been made accessible to everyone on any budget. If you were to compare Laser Hair Removal to the cost of regular waxing for the rest of your life, thousands of dollars can be saved. At The Australian Laser and Skin Clinic we offer different price packages to suit your price range and the more areas you have treated the cheaper your Laser Hair Removal package gets! Laser hair removal has revolutionized hair removal and created new possibilities for permanent hair removal. The number of benefits is incredible and it is easy to see why the use of lasers is gaining considerable popularity. 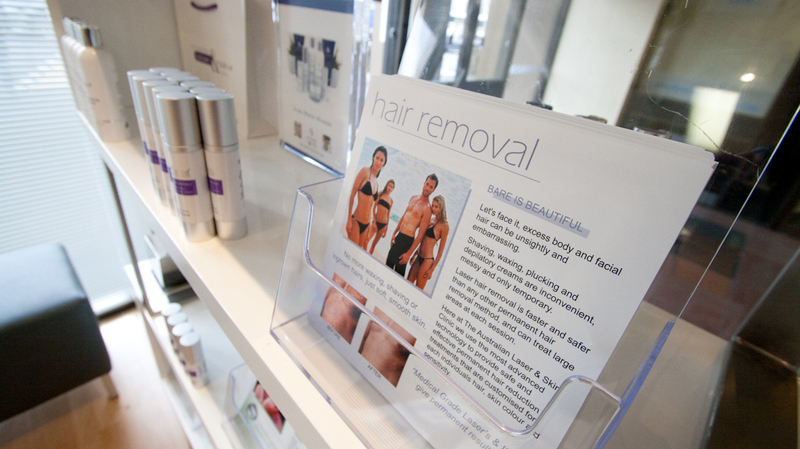 For more information about Laser Hair Removal and to book your complimentary consultation call 1300 786 166 today!